This is the right book for users if they liked the author’s “Beginning AutoCAD” workbook, or they’re looking for a clear, no nonsense, easy-to-follow text, or they want to learn more about AutoCAD such as Xref, Attributes, and 3D solids. Totally updated for AutoCAD 2015 and 2015 LT, it offers several new and improved features. All exercises print easily on a standard 8 ½” x 11” printer. For use with the PC version of AutoCAD 2015 only. Dark color interface which includes the Ribbon, Status Bar and Palettes. This contrasts with the dark model space and reduces eye strain. Enhanced Status Bar giving greater control on the tools you want displayed. Reorganized View Ribbon making it easier to control the visibility of the UCS Icon, Navigation Bar, ViewCube and Layout Tabs. Improved graphics with Line Smoothing. Cheryl R. Shrock recently retired as Professor and Chairperson of Computer Aided Design at Orange Coast College (CA) where she had taught since 1990. She is an Autodesk® registered author. Previous to teaching, she owned and operated a commercial product and machine design company, using CAD to create and document designs. This book draws upon both her teaching and industry experience. 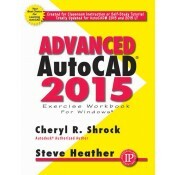 Notify me of updates to Advanced AutoCAD 2015 Exercise Workbook Sale!